Simply put, Moo is a printing company. They’ve got a great range of different products, including business cards, greeting cards and stickers. What Moo does so great (and different from most other printing companies) is that they’re integrated with all these online services you already know, like Flickr, Facebook and LiveJournal. So you can order their products with your own photos or other online content on them. What’s even better is that you’re not stuck to only one image; if you want, you can have a different image on every single item. Cool, right? I’ll try to explain a bit about each of their products. I haven’t tried all of them myself yet, but have come across most of them in real life. The most common Moo product (most people call them MooCards), they can be used as business cards (that aren’t too businessy) or as gift tags or anything else you can come up with. For the front you can use up to 100 different photos or text designs, imported from other online services (like Flickr) or you can upload them directly. For the back you’ve got six lines, which are more than enough for your basic details (name, what you do, email, website). One pack contains 100 cards and it comes in a nice sturdy recyclable plastic box. I love these cards. Practically everyone I know has these for business cards. They’re not that expensive ($19.99/€13.79/£9.99) and the quality which you get in return is just amazing. 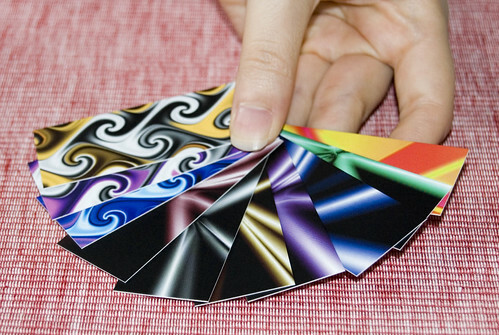 The texture of MooCards is so smooth and nice, they’re really incomparable to other business cards. Since a couple of moths ago, Moo has also started offering normal sized business cards. 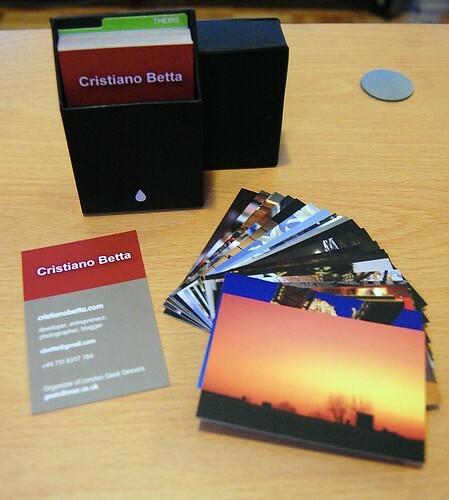 As with the MiniCards, for the front you can import up to 50 designs from other services or upload the photos directly. The back is a bit more elaborate. For starters, you can upload an image or logo and determine the placement of that image. There are a couple of different templates to choose from, but all of them look pretty neat. Besides that you can also choose from more colors and fonts for the text on the back and you can reverse the text-background color (for instance, instead of orange text on white, you can have white text on an orange background). These are just so cute! 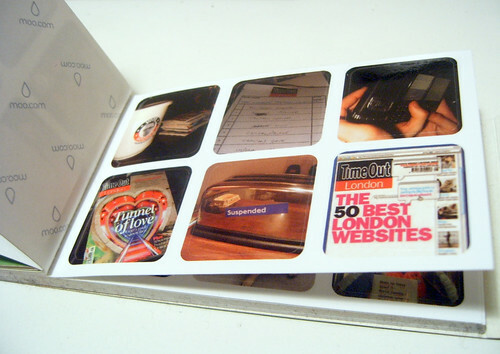 Moo produces sticker booklets with up to 90 different photos or designs (15 sheets of 6 stickers). Each sticker-sheet has a perforated edge so that you can easily tear it out and share it with someone else. If you’ve every held one of these in your hands before you’ll notice how well they are designed. You can get them from $9.99 (€6.89/£4.99). Now these I’ve never tried out myself; I’m not the card sending type anymore. Just like the previous products, Moo allows you to print whatever you want on them. The difference between them are the shapes and type of card. For starters, the Post Cards are, well, simple postcards. You can make a set of 20 (for $19.99/€13.79/£9.99) or a set of 60 (for $49.99/€34.24/£24.99) and you can personalise the front and back with different designs. Then, the Greeting Cards are standard sized cards. A pack of 10 with 10 different (or the same) images on them is $24.99 (€17.49/£12.99). You can add a message to the inside of the cards and add a photo or logo on the back. With the third option of Note Cards, you get square cards with a special flap on the side to make them stand upright. These come in packs of 16 cards (again if you want with 16 different images on them) and they cost $21.99 (€15.09/£10.99). Besides the three that I mentioned above, Moo also offers Christmas and Holiday Cards during the Christmas season. These are the same size as the standard Greeting Cards, but come in larger packs (of 25 for $41.98/€28.34/£20.99) and with different Christmas designs available. If you’re interested in ordering any of these products (and have never ordered anything with them before), I’ve got two discount vouchers to give away. Just email me at melinda@missgeeky.com and the winners will be notified on February the 28th.